Former President George H.W. Bush will be remembered Wednesday at an invitation-only state funeral to be held at the National Cathedral at 11 a.m. 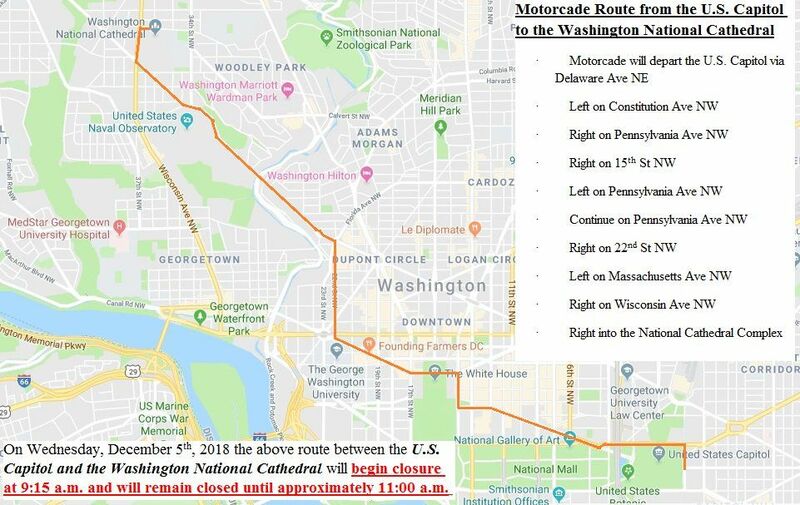 While the Bush family is expected to arrive at the cathedral on Wisconsin Avenue in Northwest D.C. just before 11 a.m., road closures started Tuesday night. Police Wednesday morning are periodically closing roads to bring dignitaries to the event. More road closures will occur around 9:15 a.m. as Bush's body is transported from the U.S. Capitol to the cathedral. On this national day of mourning, here's everything you need to know about funeral and how it could affect your life. WASHINGTON — Solemn ceremonies to honor the life of former President George H.W. Bush are being held throughout D.C. this week — the first time in more than a decade the capital city has hosted a state funeral for a former president. The former president’s body lies in state at the U.S. Capitol for public viewing until 7 a.m. Wednesday ahead of an invitation-only state funeral to be held at the National Cathedral. In addition, a “national day of mourning” declared by President Donald Trump will shutter government offices across the country Wednesday. When is the state funeral? Is it open to the public? Bush’s casket and the family will arrive at the Washington National Cathedral on Wisconsin Avenue in Northwest D.C. just before 11 a.m., when the service is expected to begin. The funeral is not open to the public. How can you watch the funeral? You can watch on TV or online. WTOP will stream the proceedings online. How can you pay your respects? You can leave a message of condolence for the Bush family on the National Cathedral site. The former president’s son, former President George W. Bush, will give a eulogy, as will former Canadian Prime Minister Brian Mulroney, who held the post while the elder Bush was president. Former Sen. Alan Simpson, R-Wyo., who has known the Bush family since the 1960s will eulogize Bush, and historian Jon Meacham, who wrote a Bush biography will speak. President Donald Trump and first lady Melania Trump will be in attendance at the invitation-only funeral but are not expected to speak. They will be on the row directly in front of the pulpit, along with the remaining former presidents and their families: George W. Bush, Jimmy Carter, Barack Obama, Bill Clinton and his wife — Trump’s 2016 Democratic rival, Hillary Clinton. Trump has had strained relations (at best) with all of them. But since Bush’s death, Trump has extended traditional courtesies to the Bush family, including allowing them to stay at the presidential guest house and visiting with them there. Also attending: Britain’s Prince Charles, the king and queen of Jordan, Polish President Andrzej Duda and other dignitaries from around the world. Look, too, for some of the graybeards from the late president’s administration. Where are the road closures and when do they go into effect? If you’re driving through D.C. Wednesday, be prepared for road closures. As dignitaries are shuttled in for the funeral, police may periodically closed roads and bridges, including the Key Bridge. Some roads near the cathedral closed Tuesday night. CLOSED STARTING AT 9:15 a.m. WEDNESDAY UNTIL AROUND 11 a.m.
Expect heavy traffic delays and closures along side roads during this time. Then, around 11 a.m., the motorcade will prepare to travel from the National Cathedral to Joint Base Andrews to return the president’s casket to Texas. This will bring closures to roads and interstates between the cathedral and Joint Base Andrews that are expected to last until 1:30 p.m. Expect heavy traffic delays and road closures to side streets. See the full list of road closures. High Occupancy Vehicle restrictions on Virginia and Maryland highways will be enforced Wednesday. Federal is government is closed. Will the mail still be delivered? President Trump’s order closing the federal government for a national day of mourning Wednesday means most regular mail service will not be delivered Wednesday and post offices will be closed, according to the U.S. Postal Service. If I’m a federal employee, how does the national day of mourning affect my pay and leave? The Office of Personnel Management, the federal government’s human-resources agency, issued guidance this week explaining the national day of mourning would be treated like a federal holiday when it comes to employees’ pay and leave benefits. Most federal employees will have the day off, but many who work in national security and defense fields will still be required to report to work. Employees who work Wednesday will be eligible for holiday premium pay, OPM said. See more answers to federal employees’ pay and leave questions. What about local governments in the area? Maryland state government agencies will be closed Wednesday, Maryland Gov. Larry Hogan announced. D.C. government agencies will remain open and operating on normal schedules, D.C. Mayor Muriel Bowser said. How does this state funeral compare to others? All former presidents are entitled to have a state funeral. Guidelines for what the ceremonies should look like date back to the mid-1800s and are largely influenced by tradition. The solemn series of ceremonies this week were planned in advance by the former president and his advisers and are generally in line with other recent presidential funerals. The National Cathedral previously hosted the state funerals of Presidents Gerald Ford in 2007, Ronald Reagan in 2004 and Dwight D. Eisenhower in 1969. Bush, who served as a congressman before becoming president, is the 12th president to lie in state in the Capitol Rotunda. The first presidential state funeral was held in 1841 for William Henry Harrison, who was the first president to die in office, just 30 days after his inauguration. Some presidential funerals — including the 1963 funeral for the assassinated John F. Kennedy — have included formal funeral processions through downtown D.C. Bush’s funeral does not, which was his choice. What comes after the state funeral? After the services at that National Cathedral, Bush will be returned to Houston to lie in repose at St. Martin’s Episcopal Church until 7 a.m. EST Thursday before burial Thursday at his family plot on the grounds of his presidential library in College Station, Texas. A motorcade will take Bush’s body to Union Pacific Railroad Westfield Auto Facility, where a funeral train will transport the late president’s remains to Texas A&M University in College Station, Texas. His final resting place will be alongside Barbara Bush, his wife of 73 years who died in April, and Robin Bush, the daughter they lost to leukemia in 1953 at age 3.